Bath & Body Works Charmed Life Shower Gel, $11, bathandbodyworks.com. Royal Apothic Thames Yachting Club Eau de Parfum, $30 for 1 oz. Anthropologie. Tommy Hilfiger Eau de Prep Eau de Toilette, $70 for 3.4 oz. Macy's. Vera Wang Preppy Princess Satiny Body Lotion, $35, Dillard's. Vera Wang Preppy Princess Eau de Toilette, $75. Zoe Kravitz: My Essentials! - "Subtle, feminine and floral - perfect." Vera Wang Preppy Princess, $75, nordstrom.com. Past Notes - The '50s were a decade marked by letterman jackets, Peter Pan-collared blouses buttoned to the top, and lots of plaid. Embrace your inner prepster with Vera Wang's latest scent, which contains notes of juicy red berries and honeysuckle. 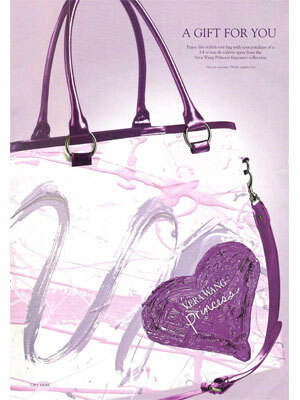 Vera Wang Preppy Princess eau de toilette spray, $75 for 3.4 fl. oz., at macys.com. Vera Wang's Preppy Princess, with tangerine, jasmine, and coconut water. "A boho-chic quality," says Givaudan perfumer Calice Becker. "It has a joie de vivre," says scent expert Jan Moran.